Last Stop Horse Rescue | Their abuse stops here and their new journey begins. THEIR ABUSE STOPS HERE, AND THEIR NEW JOURNEY BEGINS. Established in 2005, Last Stop Horse Rescue (LSHR) is a 501c3 non-profit equine rescue, sanctuary, adoption and rehabilitation program for abused or neglected horses, including “off track” thoroughbreds. 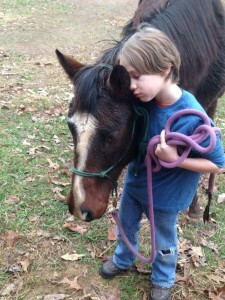 We believe in miracles for both the horses we save and our supporters who love them. It is our solemn promise to provide a safe, loving environment for each horse and allow them time to heal at their own individual pace. Love + Patience= Trust! We believe in educating the public- children especially– on the importance of animal welfare and kindness. LSHR practices relationship-based natural horsemanship, no-force training methods. LSHR does not operate any “for profit” businesses under our Federal 501(c)3 charitable license. Any proceeds generated in conjunction with our organization such as: fundraiser items, children’s book sales, natural horsemanship training clinics, and our new line of custom jewelry, “Finish Line Gems”, are exclusively used to benefit the welfare of our horses. We feel it is important that our supporters know where their donations are going- directly to the horses! Having this philosophy has helped maintain our reputation of honesty, integrity, and our “for the horse” oath which we take great pride in upholding to the highest of standards. *In effort to reduce the number of unwanted horses, LSHR has a “no breeding policy.” We ensure gelding services to any stallion and/or colt taken into our facility or under our care; Your donations help make that possible… thank you! We assist local law enforcement, animal control, and animal welfare agents by helping in their efforts to rescue horses in need and to provide food, shelter, medical care, and compassion to horses in our care. The principles of love, language, and leadership in equal doses will be followed. There is no force or intimidation, and we rely on gentleness in our leadership. At the ASPCA, helping horses isn’t just something we preach—it’s something we practice in our work every single day. Intelligent, sensitive, and true American icons, horses have been at the heart of our mission since the very beginning, and in honor of our second annual National Help a Horse Day on April 26, we wanted to share the amazing story of Benny. We rehabilitate using Natural Horsemanship methods. Our use of Natural Horsemanship sets these horses up for success in their rehabilitative process. or in their adoptive homes. SOMETIMES MIRACLES COME IN THE FORM OF SAVING A LIFE. SOMETIMES THEY COME IN THE FORM OF A LIFESAVING FRIENDSHIP. Gracie is a miniature horse who arrived at the rescue with a herd of other “minis” when her owners died. We took the whole family so they could stay together. Gracie soon had a baby here at the rescue that we named “Lily.” She was very protective of Lily, not wanting her to leave her side, and we soon realized that Gracie was going blind. She eventually allowed Lily to explore and be independent, but she was still nervous and frightened until an unlikely guardian befriended her on the farm. Don’t you want to know who that was?! In the summer of 2010 we rescued Lucky, a 12 year old mare who had a body condition score of 0 (near death). We eventually discovered that she needed a life-saving dental surgery that would help her chew her food! Through the wonderful support of so many volunteers and donors, we were able to get that surgery done at Cornell University. She still had a lot of weight to gain and a lot of healing to do, though! Would you like to know the outcome of Lucky’s surgery and recovery? Murdock, originally named Milo, was a very angry and wounded boy. He was scared. When Joyce moved to the new rescue location in Georgia, she decided to give him a new name and a fresh start. She picked the name, “Murdock,” after her Grandmother Murdock who had always been strong, and whose home had always been a safe place for her growing up. Not long after arriving in Georgia, Murdock met a young boy, also a wounded warrior. What happened next changed both of their lives. Do you want to know the rest of Murdock’s story? Believe in Miracles: Lessons from the animals at Last Stop Horse Rescue, was written to teach children heartwarming lessons of love, hope and friendship. It is a collaboration of beautifully illustrated true stories about how the animals found their way to Last Stop Horse Rescue. Your Book Purchase Helps Pay for Hay, Grain and Medical Care! BUY HERE! Last Stop Horse Rescue provides education to the general public about the unnecessary suffering of unwanted, abused, and starved horses. We provide education and support to horse owners through natural horsemanship. To raise awareness of the need to stop passing around “problem” horses. To help people understand that it takes time to reveal the “real” horse that has put walls up around it’s heart because humans mistreated it. To put in perspective that each “problem” horse started out life as the innocent new born foal, a spirit for life, and with the protection of its mare. This heartwarming (non-profit) book written with love by Toni Helen is a true story for children of all ages about Benny’s journey. 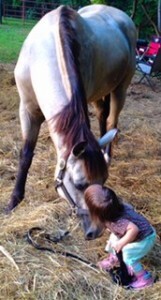 You will read and see pictures of how a horse named Benny was found near-death in a field, a prayer that was answered, and a rescuer who with the help of friends, saved his life! It is a story of faith with lessons of love and hope the whole family will enjoy. All proceeds go directly to the horses at Last Stop Horse Rescue and are tax deductible. 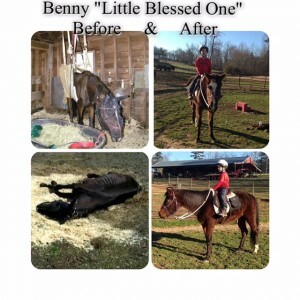 I WANT TO BUY THE BOOK AND HELP SAVE OTHER HORSES LIKE BENNY NOW!! EXPENDED TO A SECOND LOCATION IN GEORGIA! We continue to be supported by Tractor Supply locations in both Maine and Georgia.